over-restored telephone then look on eBay as they appear there quite often. especially on cradle phones where the receiver touches the perch ears. getting flash reflections and over exposure, etc. simply layed on the floor out of sight. cable services will NOT work with these rotary phones (as far as I know). A rotary to touchtone conversion circuit is now on the market for about $40.00, inquire. 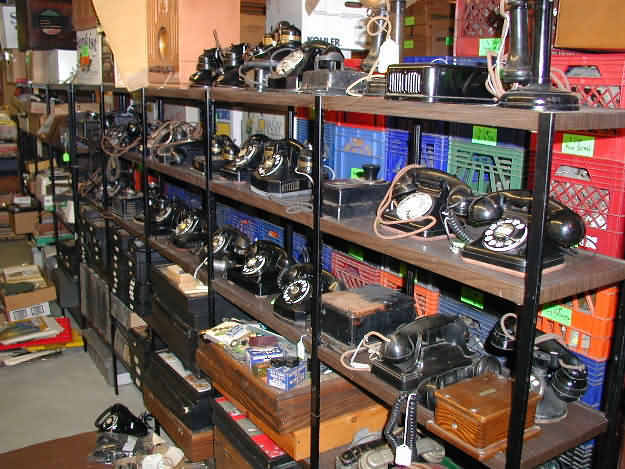 OLD TELEPHONES: Shown are some telephones waiting to be restored. 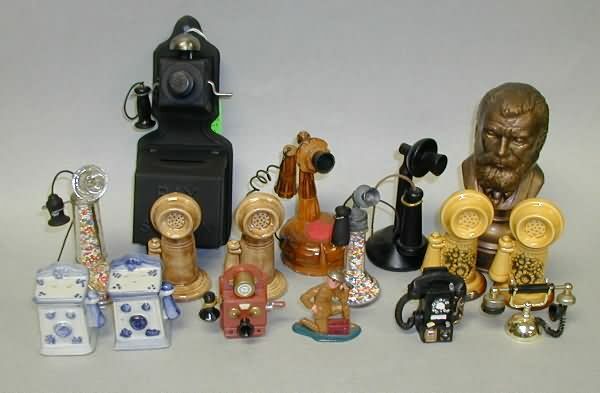 We try to offer a nice selection of old phones for people to use as a decorator item or in the case of restored phones a fully functional telephone that will work on your phone line. Some phones can have the curly handset cords replaced with cloth non-curly type cords at additional cost if desired. All restored phones are guaranteed for 6 months and may be returned within 10 days for refund if you are not satisfied (less shipping cost). WESTERN ELECTRIC 202's: Three phones that are in the restoration process. These are W.E.202's oval base with metal body that have been professionally powder coated in semi-gloss black paint: Options include the following: (1) Metal body only with no parts. (2) Metal body with a #4 or #5 W.E. rotary dial. 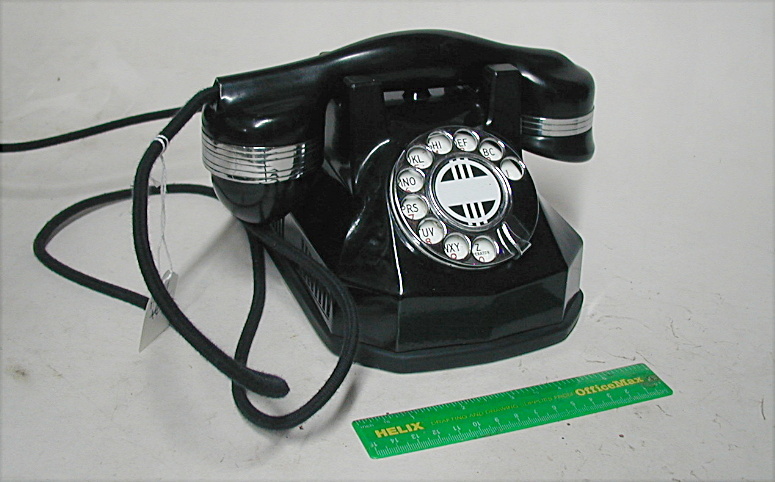 (3) An added handset of the early type E1 or latter type F1. (4) Type of handset cord, either a straight cloth covered cord in brown or black color or with a curly stretch cord in black only. (5) With or without a subset wired to phone. Note: these early phones require a external subset to make them function as a working phone. WESTERN ELECTRIC 202's: A W.E. 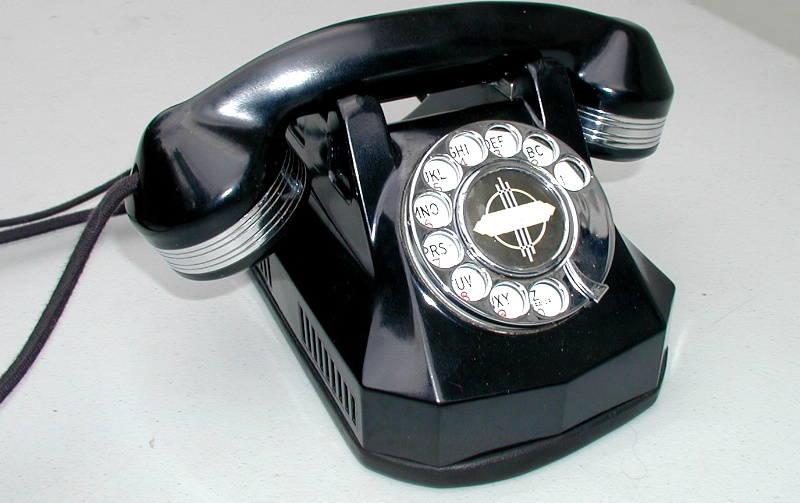 202 oval base telephone from the 1930's. It has been professionally powder coated in a black semi-gloss black paint. Has a new straight cloth covered handset cord. 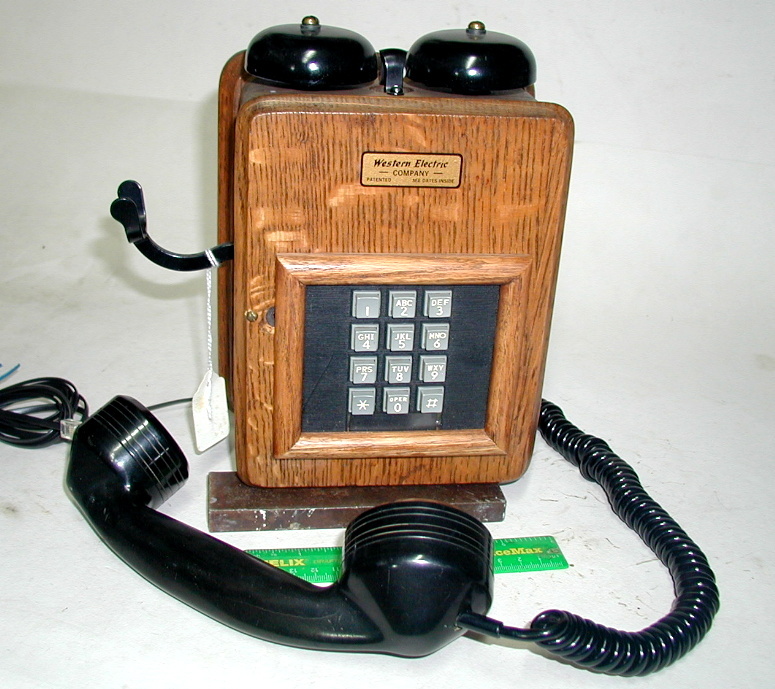 Has the early type E1 handset. Has new brown felt on base, Has a W.E. type 5H dial. Requires a subset to make this phone functional, Note: As an option I can wire to a subset if desired. WESTERN ELECTRIC 202: A W.E. 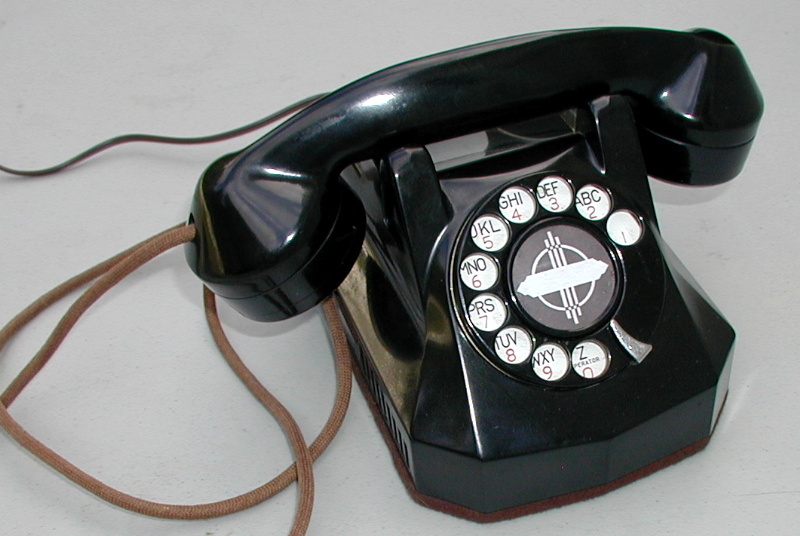 202 oval base telephone from the 1930's. It has been professionally powder coated in a black semi-gloss black paint. Has a new brown cloth curly stretch handset cord. 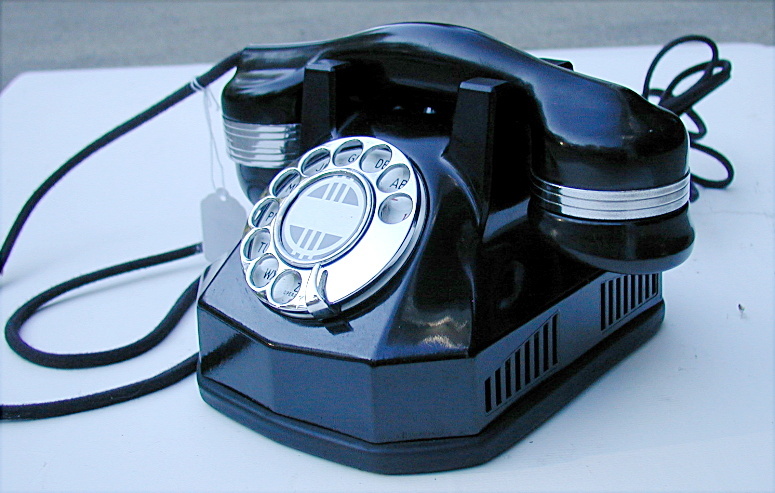 Has the early type E1 handset. Has new brown felt on base, Has a W.E. type 5H dial. Requires a subset to make this phone functional, Note: As an option I can wire to a subset if desired. 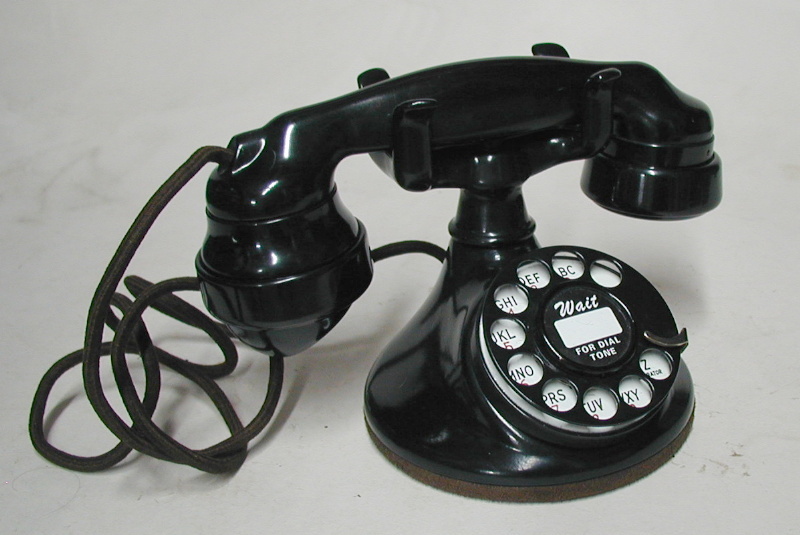 AUTOMATIC ELECTRIC 40: A restored Automatic Electric Model 40 bakelite phone. Has a very good brown covered handset cable, new brown felt on base and a brown 7 foot vinyl modular cord. Ready to plug in and use (land lines only). Also see #1005 for the deco version of this phone. WESTERN ELECTRIC 202: A W.E. 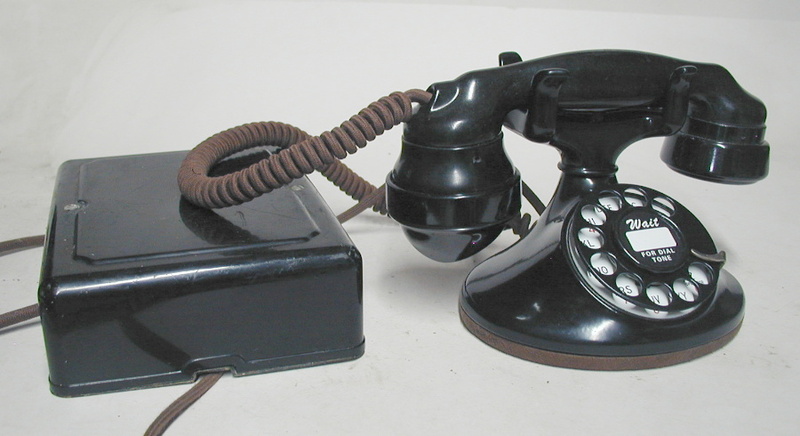 202 oval base telephone from 1930's. It has been professionally powder coated in a black semi-gloss black paint. Has very good original cloth handset cord. 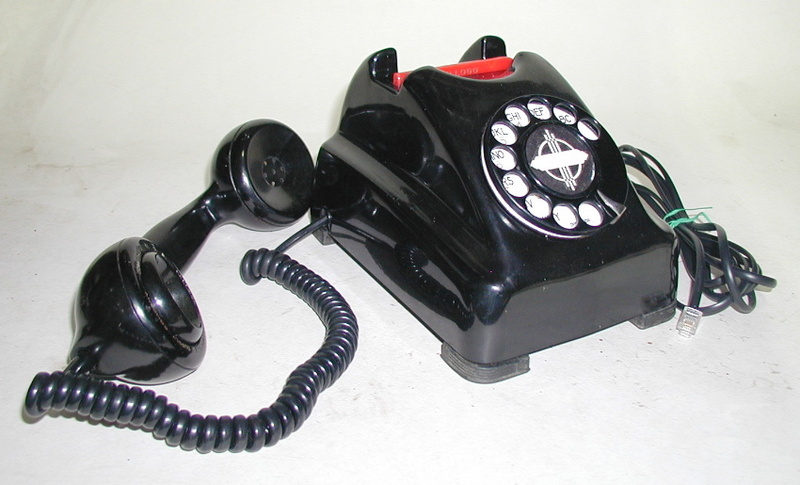 Has a type E1 handset. Has very good original brown felt on base, Has a W.E. type 5H dial. Requires a subset to make this phone functional, sold for those that may have a subset lying around. Phone is better than photo depicts due to many white camera flash reflections. Note: As an option I can wire to a subset if desired. WESTERN ELECTRIC 202: A W.E. 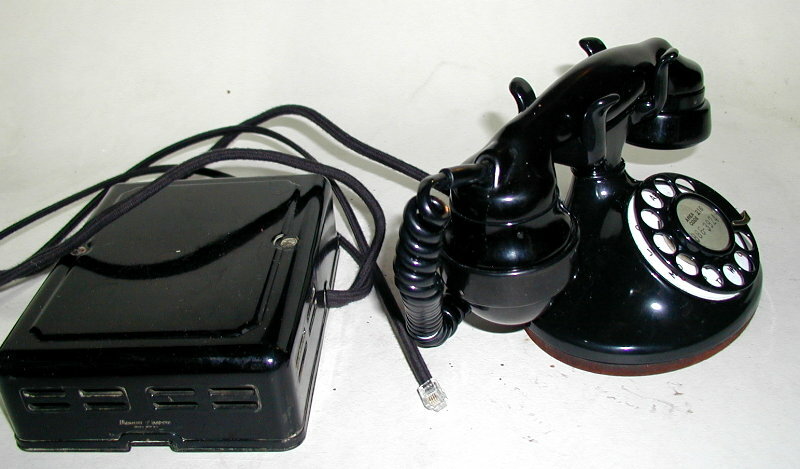 202 oval base telephone from 1930's. It has been professionally powder coated in a black semi-gloss black paint. Has a new black curly handset cord. 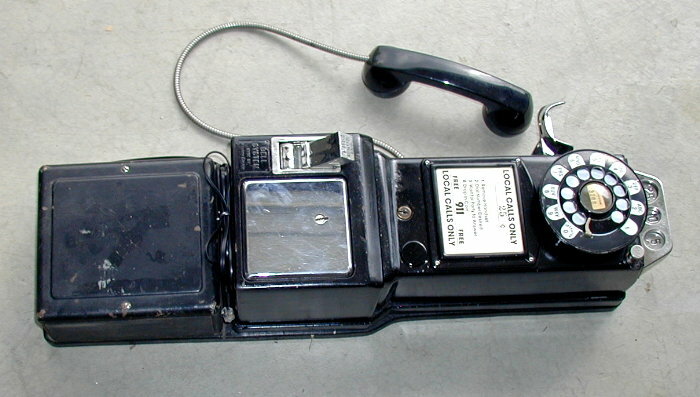 Has a type E1 handset. Has very good original brown felt on base, Has a W.E. type 5H dial. Wired to a W.E. 684 subset with new cloth-covered black cord and new black cloth line cord. Phone is better than photo depicts due to many white camera flash reflections. TOUCH TONE CONVERSION: An old ringer box converted into a touch tone phone. Use all old parts except for the addition of the touch tone pad, The oak case has been completely refinsihed. 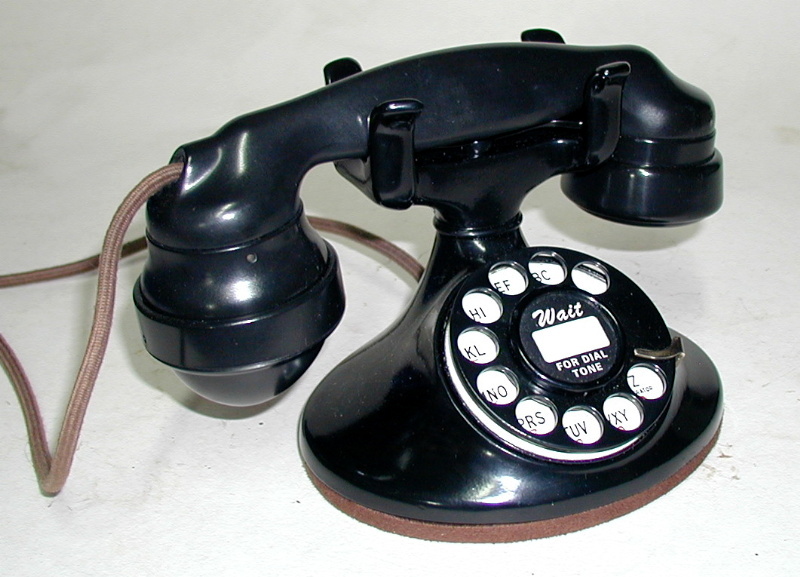 This phone gives the best of both worlds - looks old and can be used with modern touch tone services..
WESTERN ELECTRIC 302's A Western Electric Model 302, the work horse of the phone industry from mid 1930's and well into the 1950's. This is the early version with the heavy metal base verses the latter one's that had a plastic case. Professionally powder-coated in semi-gloss black paint. Has a new black stretch curly handset cord and a new black vinyl modular line cord, Fully resotred and ready to plug in and use. I have 3 in stock of this type. 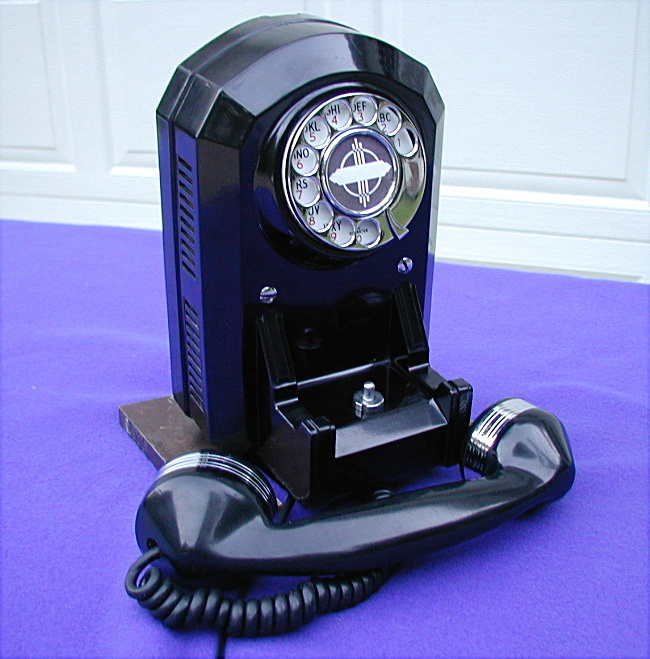 WESTERN ELECTRIC 1011/201/B1: A Western Electric 101/B1 round base phone, the predecessor to the W.E. oval base 201. 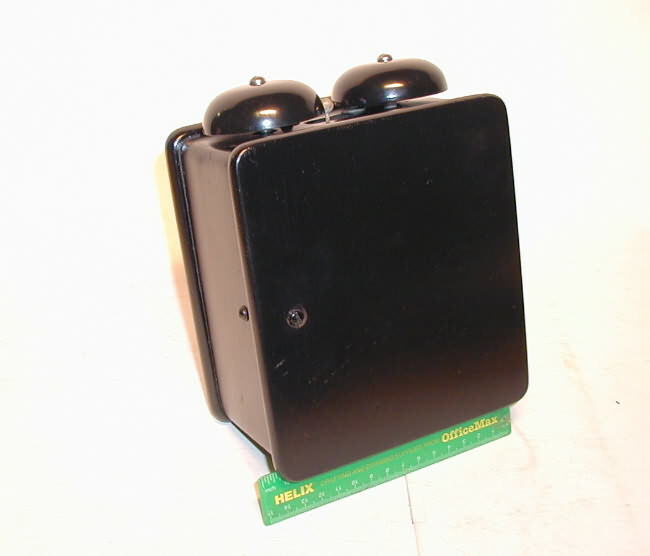 Has been professionally powder coated in a semi-gloss black paint. Has a very good original straight brown cloth covered handset cord, an early W.E. #4 "clickity clack" dial, and new felt on the bottom base plate. 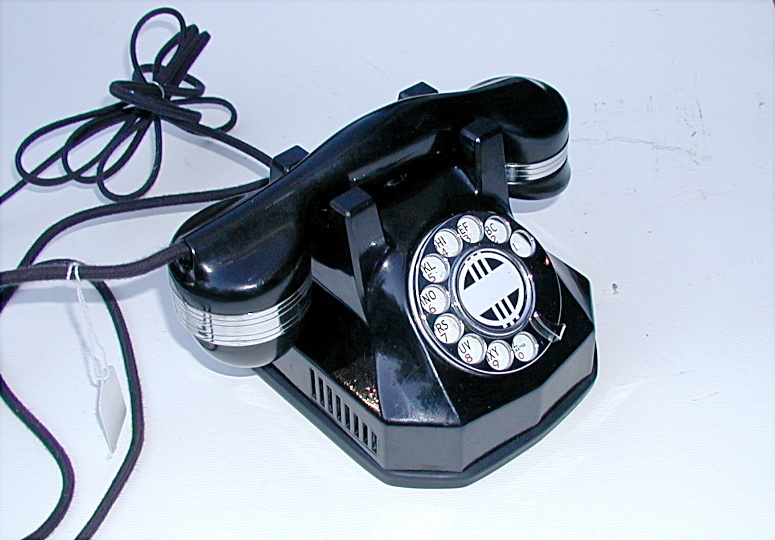 The handset is the early E1 spit-cup type. Note: To make this phone function it will require the addition of a subset - optional. 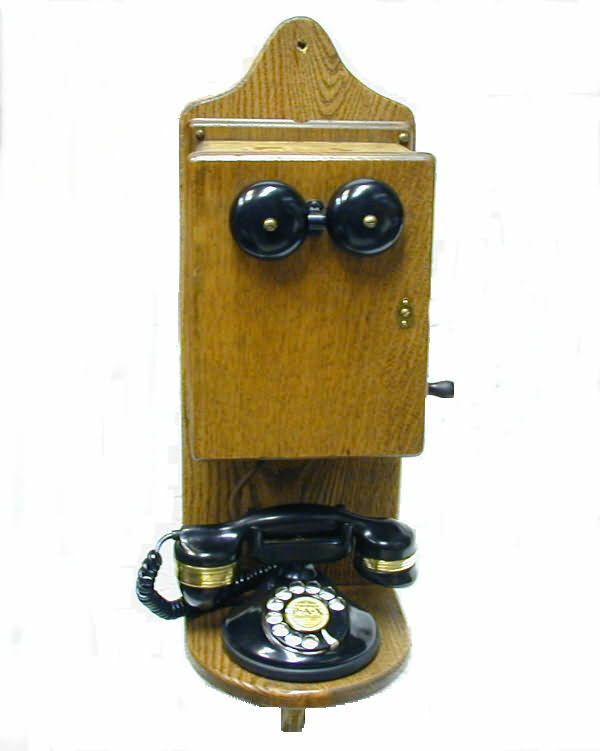 KELLOGG 1000 WALL PHONE: A 1930/40's Kellogg wall phone, often called a "Redbar" phone. Has a beautiful shinny bakelite case in excellent condition. 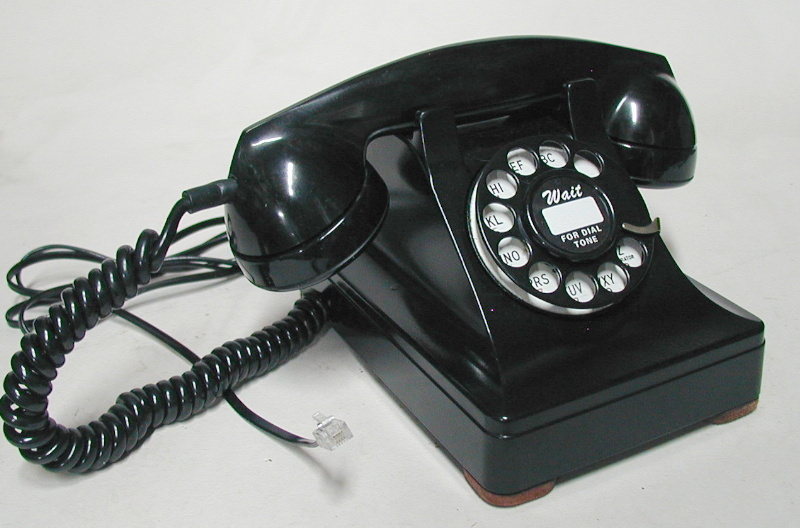 Has a very good dark brown cloth covered handset cord. Will add a new vinyl modular plug cord when the required length you need is known. The first 6 feet are free, addition feet 40 cents each. This phone has been totally restored with many hours put into it. Ready to plug-in and use (land lines only). 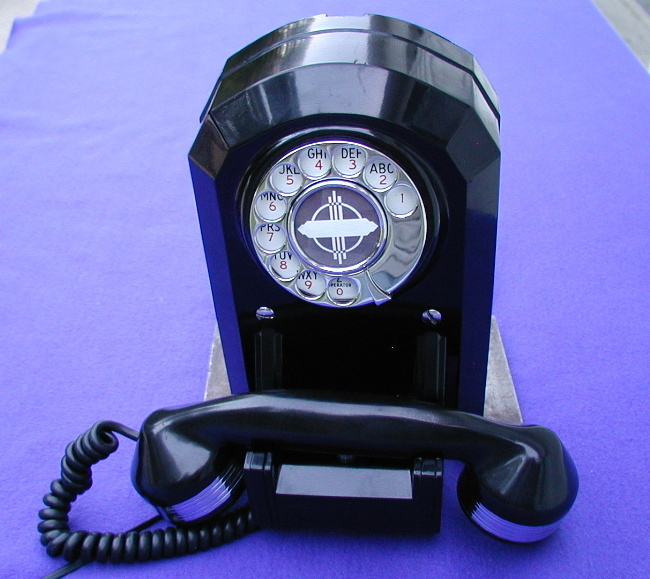 WESTERN ELECTRIC 500 CLONE: A Western Electric type 500 telephone clone made by Stromberg Carlson Co. Black plastic case is in above average condition. Nice 2nd phone for your workshop, garage or other room. Cleaned and tested for operation. 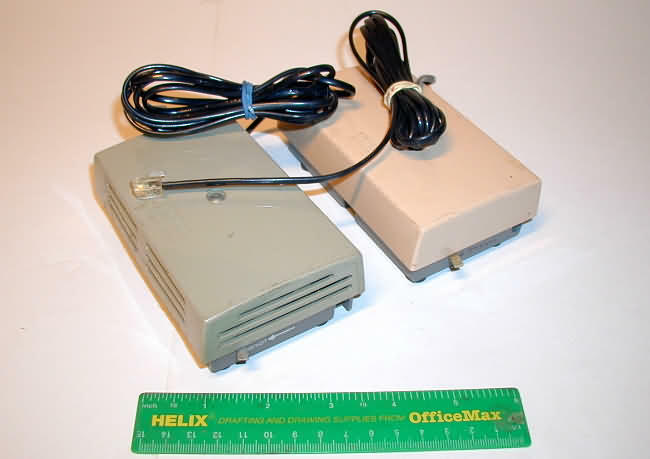 Has a modular cord. 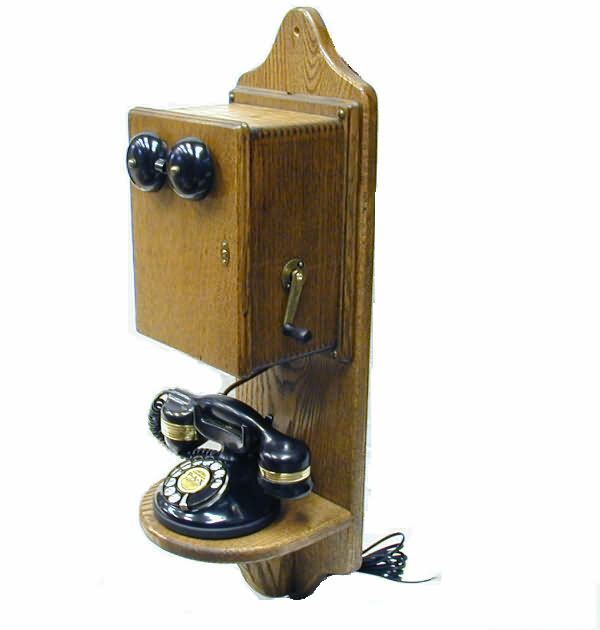 KELLOGG 1000 CRADLE PHONE: A 1930/40's Kellogg cradle phone, often called a "Redbar" phone. Has a beautiful shinny bakelite case in excellent condition. Has a new black curly handset cord and a 7 foot modular cord. This phone has been totally restored with many hours put into it. Ready to plug-in and use (land lines only). 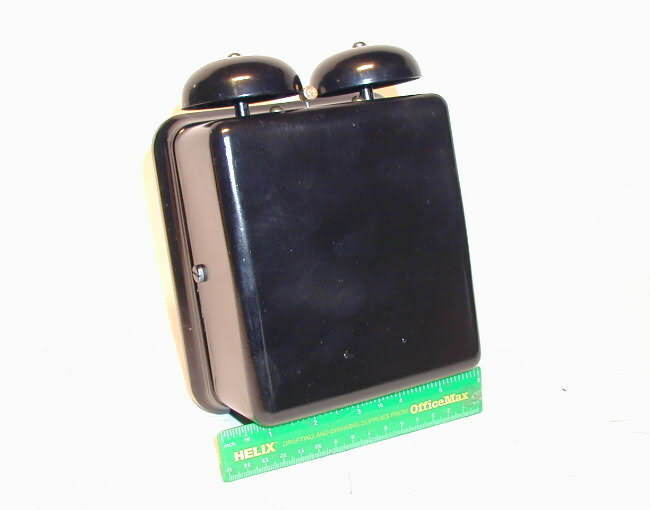 RINGER BOX: An Automatic Electric wood ringer box that I repainted and added a 1000 ohm Western Electric bell. Enough room inside for a W.E. 101A induction coil (optional). Size is 6 1/4 wide x 6 5/8 inches high. 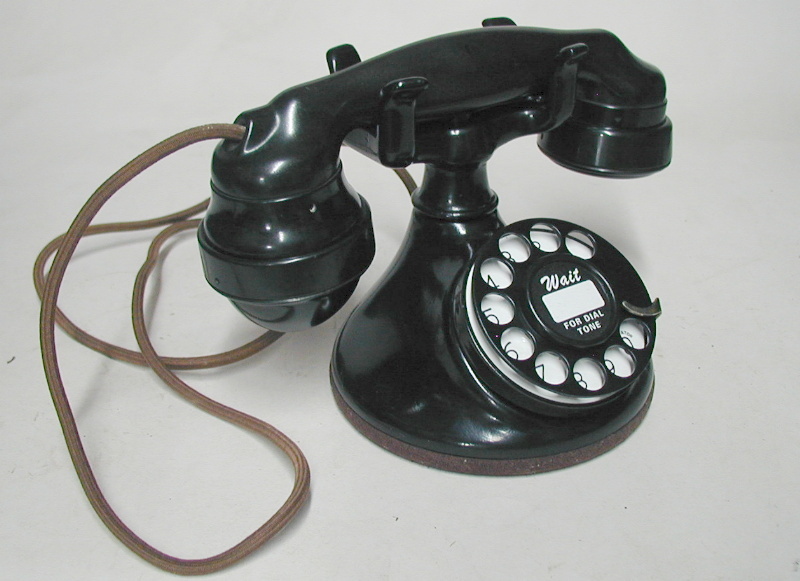 WESTERN ELECTRIC 101/201/B1: A Western Electric 101/201/B1 round base phone, the predecessor to the W.E. oval base 202. Has been professionally powder coated in a semi-gloss black paint. 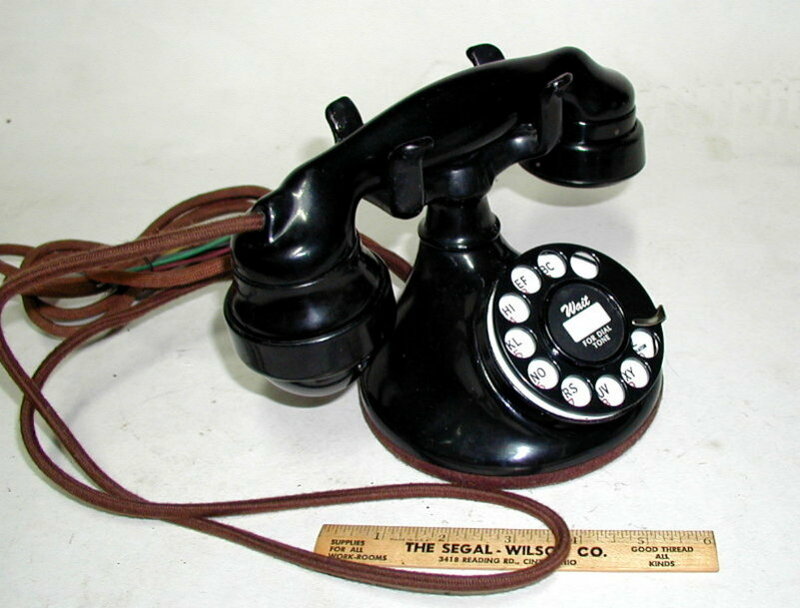 Has a new straight brown cloth covered handset cord, an early W.E. #4 "clickity clack" dial, and very good original cloth on the bottom base. 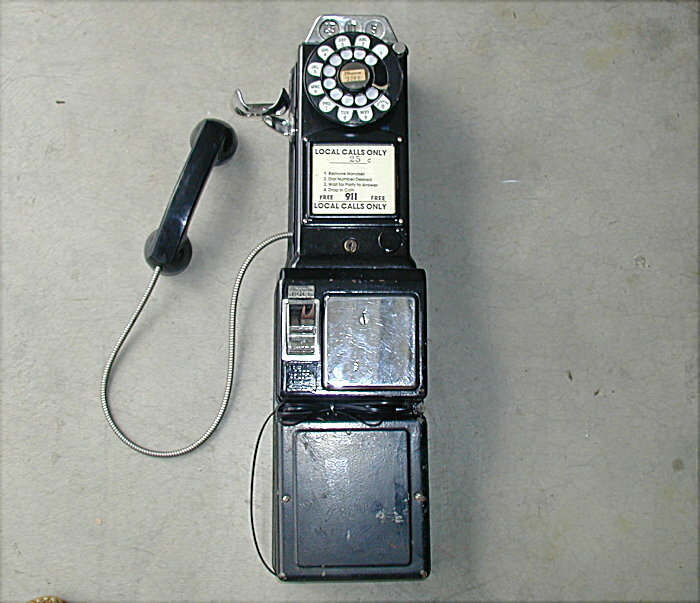 The handset is the early E1 spit-cup type. Note: To make this phone function it will require the addition of a subset - optional. RINGER BOX: A metal case ringer box that I have repainted and added a W.E. type 302 phone ringer to it. Enough room inside for a W.E. 101A induction coil (optional). Size is 6 wide and 6 5/8 inches high. 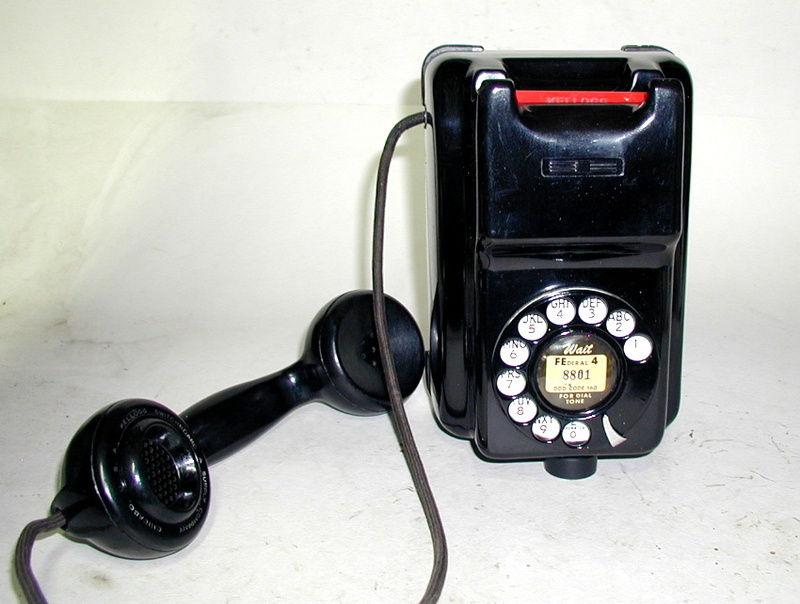 AUTOMATIC ELECTRIC TYPE 34: A restored Automatic Electric type 34 cradle telephone, made in early 1930's. 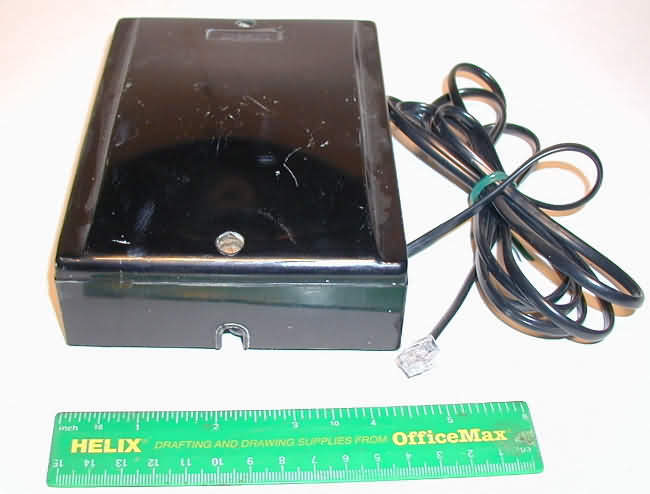 Has a very heavy duty black bakelite case. 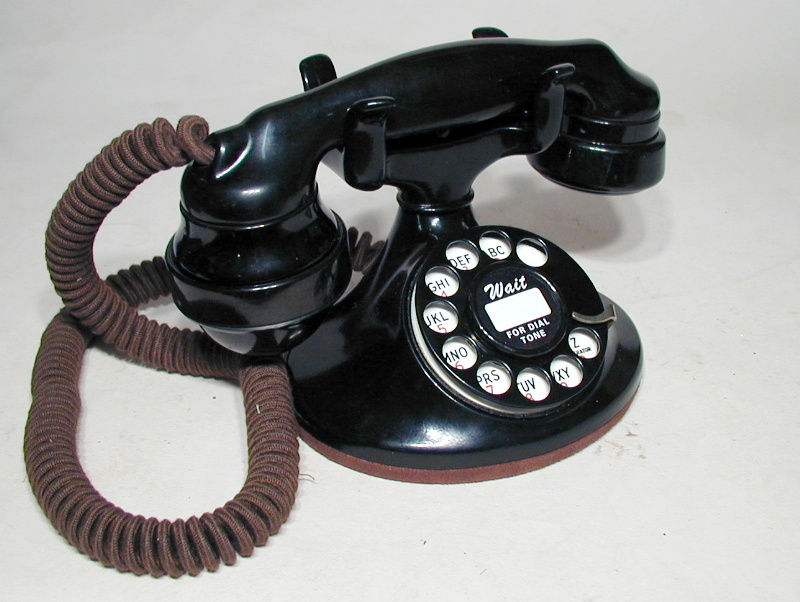 Has original black handset cord in very good condition. Has a new black cloth covered modular cord. Features brass banded handset and brass finger wheel. 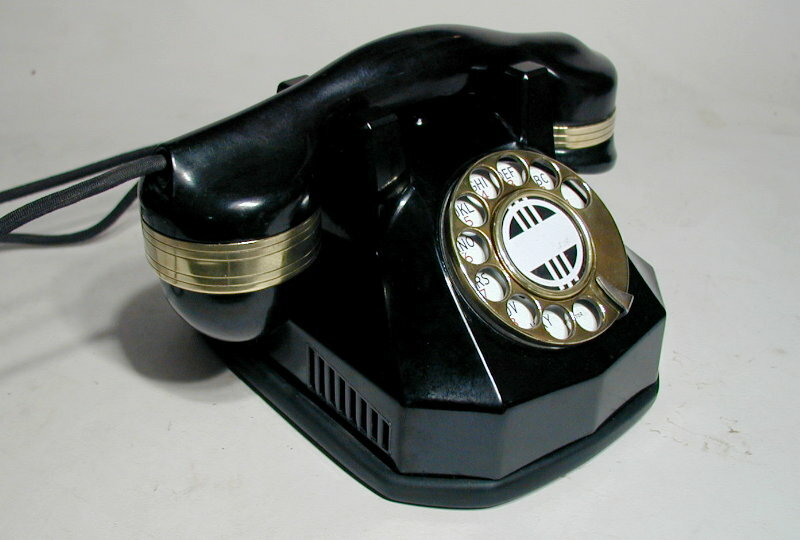 Some people refer to this phone as Art-Deco styling. Ready to plug into a modular outlet and use.